Turn a plain white door into a stunning work of art! This is a door in our entry way that leads to a guest bathroom. The door was white, and looked strangely out of place after I'd venetian plastered the walls in a slate plum color. Most everything in my house that's white gets painted in some wild color, but simply painting this door in one color would not have achieved the artistic touch I was after. 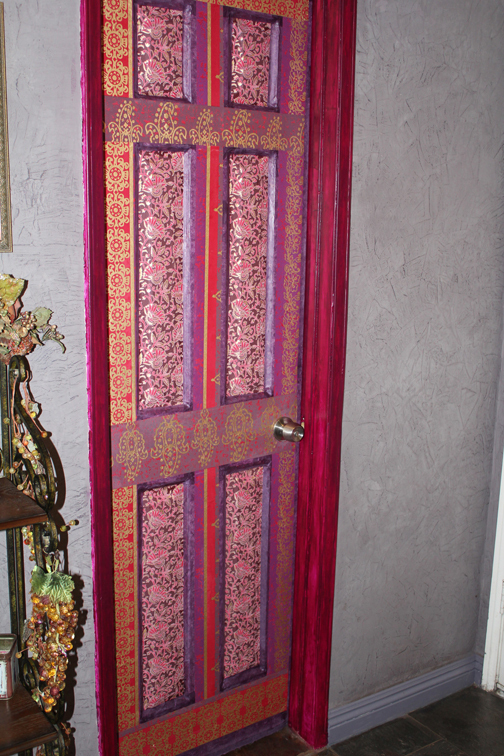 So I decoupaged the door instead, using strips of wrapping paper, Mulberry tissue paper, and some scraps of decorative craft papers, all in complimentary colors of purple, plum, magenta and red. 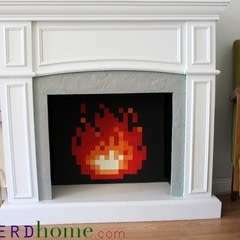 I used Mod Podge and a sponge brush to apply the glue and a flat smoother tool to work out the air bubbles. I simply brushed on the Mod Podge in sections, applied the strips or swatches of paper, smoothed the paper out with a small and flat plastic squeegee (like what you would use for applying wall paper), and then applied a final coat of Mod Podge to seal the project once I was finished. Finally, I painted the frame of the door in a black cherry color to match. 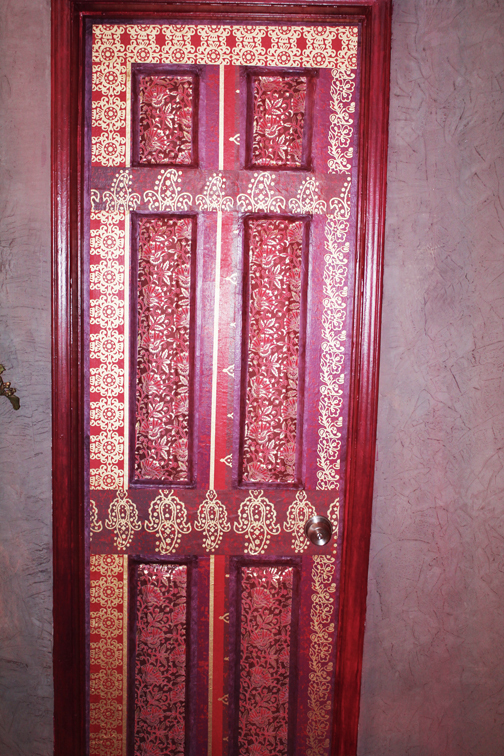 TIP: Doing this project on doors that have panels (like mine do) is a but tricky. Use the thinnest paper you can find for the insets of the panels (tissue paper is great) and do these insets first. Then you can glue your thicker paper over the flat sections of the door. 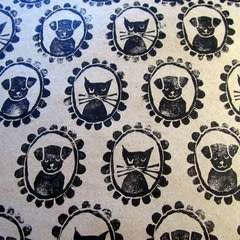 You can find great decorative papers all over the net, or at your local art-supply place. Don't use scrap book paper or card stock! It's too thick and won't give you the results you want. You can use decorative paper napkins or gift wrapping paper too. IMPORTANT: This is a semi-permanent design project. 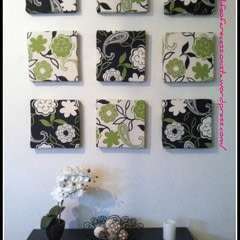 If you are going to do this type of project, keep in mind that dried Mod Podge is VERY hard to remove (much harder even than wall paper). Plan your design carefully. If you're not sure about your "commitment level," consider creating the project on a board and then hang the board on your door or wall; that way you can take it down or take it with you if you move. I prefer MATTE Mod Podge, but it comes in glossy also. 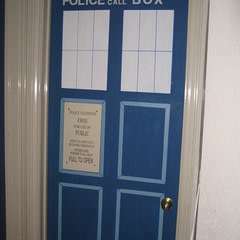 I love the door! It is s game changer. 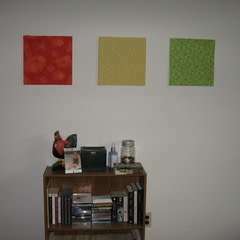 I live in an apartment where I did what I could with what I had relating to making it a livable place. I was boarded and I got and old door just like this, and I would love to give it a try. May God bless all the talented people. Thank you Kristine for the post. I love the door! It is s game changer. I live in an apartment where I did what I could with what I had. I was boarded and I got and old door just like this, and I would love to give it a try. May God bless all the talented people. It looks gorgeous~! I would never have thought of doing that. I must give it a go!